Welcome to the ‘Share With Me’ blog hop! Thank you for those that joined in last week. As you can see my new linky had a makeover so I hope you like it! I really enjoyed getting to know more of you and your lovely blogs through your posts last week. I was over joyed to see so many participating, thank you for the support. If this is your first time, welcome! Each week, I invite you to pick your favorite post of the week or an old favorite and share with me. I am a new blogger and would love to get to know more bloggers and their blogs so I decided to create a linky where we can get together and share our favorite posts. This gives us a chance to meet other bloggers and have a variety of new blogs to read. Want to join in, all I ask is no reviews, giveaways, or linkys (the post can be along side other linkys but cannot be a linky itself). 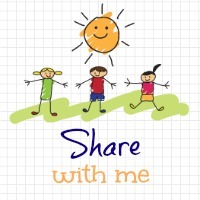 Don’t forget to include the Share With Me Badge or a link back to here, we want to know where you are partying. I will be sure to return the favor and share your post on Twitter for those that display the badge. Each week I will pick a favorite post and feature it on the following week’s link up. I also have made a Pinterest board to pin all my favorites in one place, check out my board here. Without further ado last week’s favorite was from the lovely Hockey Wife Hockey Life – What Went Wrong At My Wedding. If you missed it last week, here it is again! Please make sure to visit your host, Lets Talk Mommy and comment on a few others while you are here. Linkys only work if we share the love as well as share our post. Your welcome, come join in. Love to have you and get to know your blog! Thank you so much! I am very excited about it, getting to know new bloggers and their lovely blogs. Thank you Honey! I hope to see you again next week. 😉 I enjoyed your post and sneaking around your blog. It’s a great way to get to know other bloggers and their lovely blogs. First time linking up this week! Great blog hop! Thank you Zena, so sweet of you. I am nervous as I only just started it. I am fairly new at blogging so it’s a great way to get to know other bloggers and new blogs to read! I hope to see you again soon! 😉 Thanks for linking up. Thanks for the linky. Linked up for the first time look forward to reading some new blogs. Thank you so much for linking up Tracey, it’s a great way to get to know more bloggers and great blogs to read. I was nervous as it’s my first hostessing a proper linky. I kept thinking will anyone link up …. sat biting nails…waiting for it. hahaha Hope to see you again soon. Thanks Katie. Glad people are enjoying it, I was so nervous no one would come to lil ole me and link up! 🙂 Love getting to know more bloggers and great blogs to read. I’m a brand new blogger so forgive my ignorance but I’m not quite sure what to do! I’ve put your badge on my Blog, what do I do now 🙂 Lovely blog by the way! Hi LilMamaSuzi, welcome and congrats on starting a blog. You will love it. That’s great, now all you do is go to my Share With Me ~ wk 6 post http://www.letstalkmommy.com/2014/03/share-with-me-wk-6/ and at the bottom of the post it says CLICK HERE TO ENTER then it will ask for your post url, your name, post title, email, and then pick a picture to accompany your post, your email won’t be shared publicly. Then comment on your host post, which is me and a few others. They will comment back on yours. This is how most linkys work. It’s great way to get to know other bloggers and get yours known too. Check out more fabulous linkys on my navigation bar under Linkys I love. If you have any trouble feel free to email me hun. letstalkmommy@yahoo.com Good luck and thank you so much for stopping by and linking up!!!! Look forward to getting to know you and your blog. I think I managed but I only put in my sites name, not a link to an actual blog post on my site, is that ok? Then I can just click on everyones elses pictures and have a squiz and leave comments? Sounds good 🙂 I’ve linked it to post I wrote a couple of weeks ago. Thanks so much for your help! First time linking up! Great blog hop! 🙂 Pleased to ‘meet’ you too. I’m an ex-pat Canadian living remotely in the UK and I’ve linked up our latest outdoor adventure post. Welcome Elizabeth, and fellow west coaster… thank you so much for linking up that’s great. I look forward to getting to know you and your great blog. Off to check out your link now. Hope you are settling in the Uk ok. What part did you move from and to? I am seattle to manchester! It’s so different for me. How about you? That’s fantastic Emma. Thank you so much. Hope to see more of you here too. It’s a great way to get to know other bloggers and lovely new blogs to read.